Walk through any garden where roses are present, and you’ll undoubtedly be attracted by the luscious blooms with their fragrant petals. I’ve seen this happen time and again, watching how the beauty of roses attracts passersby, even those who don’t have a particular love for gardening or flowers. There is just something magical about roses and how alluring they are. For those of you who have grown roses before, you will probably agree that they aren’t the easiest plant to grow. This is true of the hybrid tea, which are considered to be the classic modern rose with tall, upright stems and large flowers. The downside of this type of rose is that they tend to be susceptible to a variety of diseases that affect the foliage and also are less fragrant than the old-fashioned roses of the past. Today, there is a new class of roses that are rapidly gaining presence in gardens everywhere. Shrub roses are the newest and coolest type of rose in the gardening community. The existence of these roses is due in large part to one man – an Englishman to be exact, David Austin. A rose breeder by trade, he undertook the task of combining the best traits of old-fashioned roses with those of modern roses. For those of you who are unfamiliar with old-fashioned roses, they are prized for their intoxicating fragrance, disease resistance, and petals that are arranged in a delightful mixture of swirling rosettes. The main drawback of many of these old-fashioned roses is that they only bloom once a year. After growing hybrid tea roses for years, my rose garden has gradually seen an increasing number of English shrub roses take their place. There are many things that I enjoy about these roses, and despite their name, most do beautifully in my desert garden and are easier to maintain than the few hybrid tea roses that remain. The perfume that arises from each bloom never ceases to immerse me with its intoxicating fragrance, which makes the cares of the world temporarily melt away. On a more practical note, I am so busy assisting other people with their gardens, that I don’t have a lot of time to fuss over mine, so any plants, including roses, must thrive with little attention like my English roses. However busy I am, I do take a minute or two to go out in the garden and cut a bloom, or two, and bring inside where I can view its beauty and enjoy its fragrance close up. If you want to grow roses without a lot of fuss, this English class is for you. So when Firefly Books sent me the book, “The English Roses” to review and one to giveaway, I was very excited. At first glance, all you want to do it thumb through the pages and drool over the colorful photographs of truly stunning roses. The first part of the book talks about the history of how these old-fashioned/modern hybrid roses were developed. I found it quite interesting as I’ve always had a secret desire to be a rose breeder. If however, you aren’t a fan of history, feel free to skip to the gallery section of the book, which profiles over 100 varieties with large photographs, which showcase the beauty of English shrub roses. I wasn’t kidding when I said that you’d be drooling over the photos. This is a large book and is suitable to be displayed on your coffee table where visitors can enjoy the beautiful photographs. While reviewing this book, my grandson, Eric, climbed on my lap and was immediately entranced by the flowers displayed on the pages. He had to smell each page, hoping to get a whiff of fragrant roses. No matter how many pages, he sniffed, none of them smelled like roses. But, I love how his excitement over this book shows the influence that roses have on us, and it begins at a young age. Eric has been in my garden, and I’ve taken the time to show him how lovely the scent of roses are, and he recognized them in this book. As you can see, I was sent two red roses to test how well they will perform in a desert climate. I can hardly wait to see their first blooms! One rose that I have already growing in my garden is ‘Olivia Rose Austin,’ which is a newer introduction. I was impressed at the number of flowers produced the first year after planting. It also bloomed throughout much of the summer, which is often when roses cease flowering. I’ve grown David Austin roses for over 20 years, including the varieties ‘Abraham Darby’, ‘Graham Thomas’ and ‘Juliet’. I encourage you to try out one, or more, of these English beauties in your garden. They aren’t typically available at your local nursery but can be purchased online. To get you started on growing your own, I’m hosting a giveaway where you can win a copy of David Austin’s book, “The English Roses”. To enter, leave a comment and tell me what you love about roses. I’ll draw a random winner on Wednesday, February 8th. *Disclosure: I am so excited about these two roses, which were sent to me free of charge, to test in my garden. Roses have enchanted gardeners over the centuries with their colorful petals arranged in intricate rosette shapes, which release intoxicating fragrance into the air. For those of you who have followed my blog for a while, you’ll know about my love affair with roses and that it was this lovely flower that created my passion for gardening. AZ Plant Lady taking time to smell the roses at the Santa Barbara Mission in California. If there is a rose garden nearby, I’ll find it, excited to explore both old and newer varieties of my favorite flower. 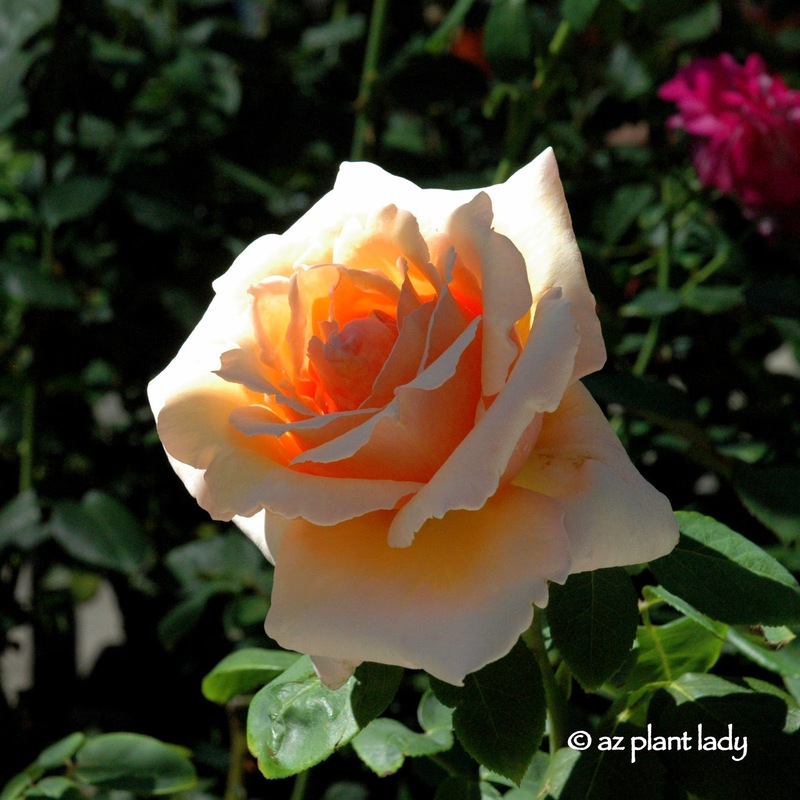 When I first began growing roses in my Arizona garden, I used hybrid tea roses as I was obsessed with the regal beauty and upright form of their blossoms. As the years passed and I found myself in a new home, the question was, what type of roses would I plant? Should I go with old favorites or branch out and try new ones? In the end, I did both. My outdoor space is broken up into separate areas and my roses grow in a raised bed in the side garden where I can view the flowering plants from my kitchen window. Within the garden, is a single ‘Mister Lincoln’ hybrid tea rose. Of the over forty different hybrid tea roses that I’ve grown through the years, this lovely, red rose is unsurpassed in both beauty and fragrance. The rest of the garden is home to new roses as well as several perennials that growers throughout the country send me to test out to see how the perform in the desert climate. So what are the other roses in my garden? I’ll let you in on a secret – hybrid tea roses are no longer my rose of choice. Why, you may ask? Well, I’ve discovered a new category of roses that highly fragrant, have beautiful old-fashioned blooms, and are very low-maintenance. Rose breeders have taken the best traits from old-fashioned roses and modern roses and combined them to create the perfect type of rose, in my opinion – shrub roses. An English breeder, David Austin, has pioneered this new type of rose and is famous for the majority of truly stunning shrub roses on the market and in gardens throughout the world. I have several shrub roses in my garden and two new roses have recently found a home in a desert garden – mine! I’ve grown David Austin roses in the past and currently have several in my garden. Receiving a package in the mail is always a welcome event, particularly when it contains plants. The arrival of this box was initiated months ago by a conversation that I had with the folks at David Austin Roses last fall. I was describing the success that I had with one of their newest varieties that was sent to me the previous year. They asked me if I had had success with growing any of their red varieties and offered to send me two different red roses to see how they would perform in a desert garden. Fast forward four months later and a box showed up on my doorstep filled with two bare root roses. Let’s be honest, bare root roses aren’t going to win any beauty contests. In fact, they are quite ugly, but they won’t stay that way for long. Bare root roses must remain moist and need a good soaking before being planted. This allows the roots to help replenish any water lost as well as prepare it for planting. Allow the roses to soak for 8 – 24 hours before planting. During this stage, some people like to add vitamin B-1 transplant solution, however, this is optional. I remember my horticulture professor state over and over again, that there is no published studies that showed that using vitamin B-1 had any effect on successful transplanting. If you want to add it, go ahead – I’ve never used it. The next day, it was time to plant. Before putting the rose in the hole, you need to amend the soil – click here to see how. When planting bare root roses, you need to create a ‘cone’ of raised soil in the middle of the hole so that the base of the rose rests on the top with its roots fanned outward. If the roots are too long, you can cut them a little shorter. Fill the hole in with soil and tamp it down to get rid of any air pockets. Create a shallow basin around the rose and water deeply. Don’t fertilize the new rose until it has produced its first set of blooms – it needs to concentrate on growing roots first. It’s hard to believe that this cluster of naked stems will soon give life to glorious, fragrant red roses in a few months. I’ll be sure to keep you updated as to how they do. I can’t wait to see if these red roses do well in my desert garden. These shrub roses can be hard to find in your local nursery, but can easily be found online. Now, something fun for you! 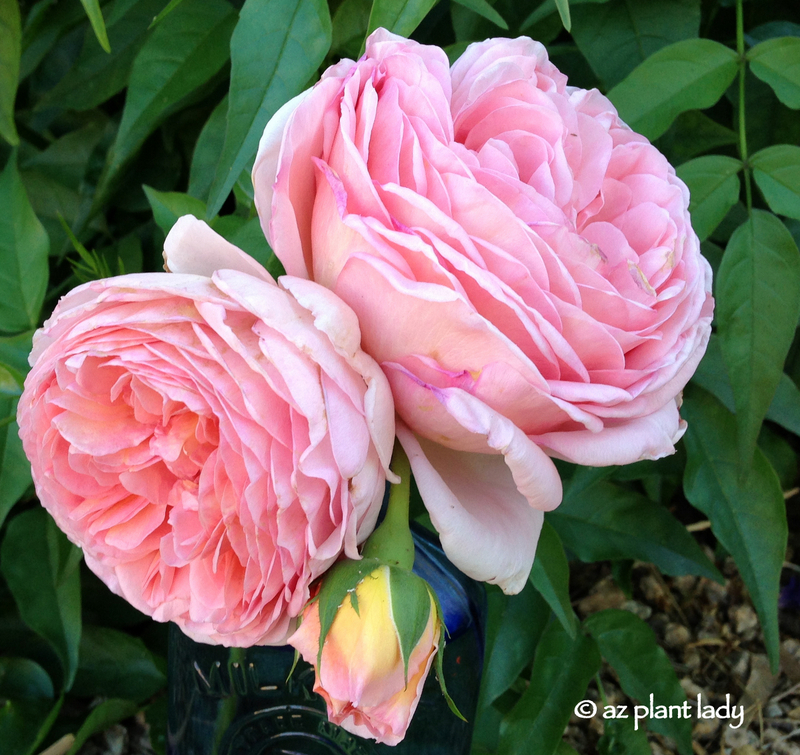 I hope that I’ve inspired you to try growing David Austin shrub roses. You may have noticed that I didn’t tell you what type of David Austin rose varieties that I received. I invite you to come back for a visit when I’ll be hosting a book giveaway where you can win your own copy of “The English Roses”, which is a lovely book filled with spectacular photos and detailed information on different varieties of shrub roses. I’ve enjoyed my copy very much and it looks great sitting on my coffee table. **What are your favorite type of roses to grow? In the Desert Southwest, we are blessed with two different blooming seasons – spring and again in fall. While two bloom seasons is generally one more than many regions experience, roses don’t enjoy the heat of summer and go into summer dormancy. That means that they just exist and don’t grow or bloom significantly. Their leaves may show signs of sunburn. However, once September arrives and the days begin to grow shorter and temperatures begin to cool, it is time to lightly prune your rose bushes, which will stimulate new growth. Begin by pruning back 1/4 of the top growth, removing sunburned foliage and any flowers present. As always, prune back to an outward facing bud at an angle of 45 degrees. Seal any pruning cuts larger than the diameter of a pencil with Elmer’s glue to prevent borers. Fall is also time to fertilize roses in preparation for their fall bloom season. Apply an organic fertilizer formulated for roses. Afterward, be sure to water in well. **For those that want to go the extra step, I would recommend soil amendments such as compost and manure in addition to rose fertilizer, which results in greater growth, lush foliage and blooms over the long term. To do this, first make 4 – 5, six-inch deep holes around each rose, placing them at least 1 ft. from the center (I use the end of a broom handle for this). Then apply a mixture of aged steer manure and alfalfa pellets (rabbit food) and pour into each hole. Water in well. The aged manure improves the soil structure and slowly releases nutrients. The alfalfa pellets release a type of alcohol as they break down that roses just love. By lightly pruning and fertilizing in early fall, you’ll enjoy a fall filled with beautiful roses.